Desert or Paradise is the latest book released this 2013 by Sepp Holzer. The newest book talks about Holzer's wonders for bringing life to dying landscapes. 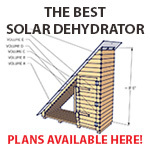 Through this book, he shows his methods and techniques that will inspire all of us to think twice on those old failed solutions for drought which are all aided with illustration, graphs and pictures. Water basin creation is the highlight of this book because according to Holzer, water is the key for earth regeneration. Has anybody else read this yet! It is so good. I am already planning water retention spaces. This book is so huge because it shows how Sepp integrates aquaculture into his Permaculture systems. I highly recommend it. James, would you mind telling me what Holzer has to say in that book (if anything) about normal annual rainfall amounts at Tamera in Portugal. Thank you, yes I know about google. I live in Portugal and I have a pretty good idea about what the climate is like here. In fact I know the exact figures for Tamera. What I would like to know is what Holzer has to say about it in that book and how close it is to reality. The book mentions 500 to 600 mm of rain annually for Tamera. Thanks Burra. Thats a very long way from what Paul Wheaton said Sepp told him when they met. I don't think Sepp is very good with numbers. He's more into solving problems. edit to add - I also think Sepp was mixing up Tamera with the Extremadura project. Tamera plant growth looked very normal for Portugal (from the photos you posted on permies.) Paul was talking about a few inches of rain, and the reality is a few feet. That is a big difference ! I don't think even Extramadura is that dry. We are both closer to there, than Tamera, and yet we have a climate very similar to Tamera. I would certainly be interested in seeing the book. You are very kind. Found this amazing mini documentary on the Tamera Community. John D. Lui is superb! I love Green Gold! Love it! I love John Liu, I wish our world leaders would watch his films. 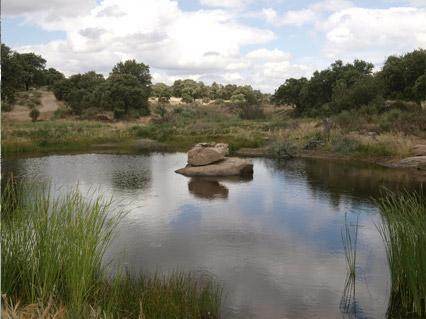 The top water retention in Tamera is really massive. Below are the photos from 2013. You will recognise it in video above at 5:05 filmed in 2012 if i'm not mistaken. Dam was not completly full yet in 2013, but you can see huge difference. I saw a few things in the video that are warning flags for me; on the good side, it looked like the large dam was well-built. I hope they had adequate design for the finishing, because I saw cuts and steepening of slopes above the reservoir: did topsoil get back on those steep slopes? It would really take a boots on the ground inspection, but I've looked at the satellite view; it looks like there is plenty to do as far as "starting in zone 1" and in teaching residents the local horticulture and ecology; my understanding is that many involved at Tamera are not from Mediterranean climates, and too few these days are experienced in interacting with living systems. I am a big fan of "starting at the headwaters" while I do appreciate the idea that large dams are best done while energy is cheap, at the beginning of a village project there is EVERYTHING to be done. For those of you who have been to Tamera: Does it look to you like the evaporation from the big reservoirs there will not be too much of a loss in the dry summer climate? Is there adequate training for residents in zone 1 and 2 appropriate tactics, with design support and feedback for implementing good water storage "at the headwaters" ie storage of roof. trail and road runoff throughout the community? ("value the small and the marginal") What I saw on the satellite view looked pretty bleak around the buildings. Are people living in their gardens? I noticed in the video that the olive picking was being done with 4 legged ladders, which are designed for use on level hard surfaces, rather than fruit ladders, which are tripods designed for use on rough ground. Ladder falls can be very serious. That's not care of people. The Eugene community is now caring for a community member, formerly very active, who is now a quadriplegic due to a fruit tree accident. Disclosure: one young friend, who was very involved in the global ecovillage network, spent time at Tamera was quite angry afterward that she had not been advised that she would be under persistent strong pressure to adopt an active poly lifestyle, which got me to wondering what the priorities are in the community. Evaporation from dams also feed souroundings with moisture and loss of water is not that crucial, because plenty of water is left and they are filled again during winter. I may be wrong, but isn't the current state of Tamera something that Sepp has recently wanted nothing to do with? I thought I heard on one of Paul's podcasts that Sepp thought they changed his design to the point where is is a disaster in waiting. Rick Valley wrote: Disclosure: one young friend, who was very involved in the global ecovillage network, spent time at Tamera was quite angry afterward that she had not been advised that she would be under persistent strong pressure to adopt an active poly lifestyle, which got me to wondering what the priorities are in the community. I went to the Water Symposium at Tamera in 2012 with my 16 year old son. We were unaware of the 'free love' philosophy there until after we arrived, and although they informed us of it there was no pressure on us as visitors to the symposium. One young lady did make a concerted effort to 'pick up' my son, which freaked him out a bit and he spent the entire evening glued to my side to try to avoid her, which I found rather amusing. The very last talk of the symposium was given by Tamera's founder and it covered a lot of the background and philosophy of the community, including phrases like 'communal intelligence'. This totally freaked my son out and he sat there seething and muttering, rather too loudly, about 'Hive Minds!'. A few of the other attendees overheard and were obviously suppressing grins and nods of agreement, so I think it's fair to say that Tamera's community is not for everyone. They are doing amazing work, and there is a lot going on there that we can all learn from. My son, however, refuses to return! 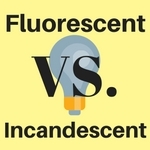 Here are a couple of links that might prove interesting. Does it count as a desert if the precipitation is already greater than evaporation? I don't want to discredit the work done there; it looks pretty amazing. But I don't call 600 mm of water per year a little amount of water, either. I give this book 7 out of 10 acorns. This book shows a wide array of Sep Holzer's projects in various parts of the world. 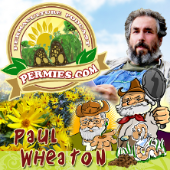 His stories are extremely encouraging and inspiring, and show his mastery in applied permaculture, his style. 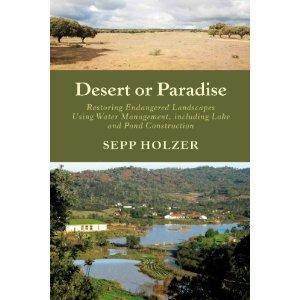 Sepp is a master of water retention and earthworks, which is clearly shown in this book. In my opinion the book is lacking details though and it focuses too much on Sepp's intuition rather than on hard facts that the reader could learn and apply. It is definitely worth reading but lacks practical value. Neal Spackman wrote: I don't call 600 mm of water per year a little amount of water, either. Yup. If I take my annual rainfall, and add to that my annual irrigation the total moisture added to my place is about 600 mm. I'd have a hard time calling a place that receives 600 mm of rain per year a desert. I think we have to consider the rainfall in it's year round cycle, we have actually places with even higher rainfalls that are under desertification. when rainfall is all concentrated in a very short period it may be overall high but useless if not accompanied by earthworks that help retain water in the landscape. In places where an abuse of the land with grazing or the creation of monocultures of trees as olives or almonds I guess the land gets always more poor and less capable of retaining water. thats how we can speak of desertification even if there is a considerable overall rainfall. the fact that we have always more hectares of agricultural land that is made up of bare soil and no trees, and perennial root systems, transforms land in deserts. deserts aren't only places where there is little rain but places where there is no cover, there is bare soil, and water will not infiltrate but wash away topsoil and create erosion, in a vicious cricle. I saw last week in the south of Italy, in Basilicata, I gues the annual rainfall is quite high maybe higher than Tamera, or Portugal that I don't know directly, but in Basilicata there was great erosion caused by overgrazed land, and poor diversity of plants, it seemed a desert to me. Sepp is very passionate about earthworks that restore water retention but even about planting trees that restore water retention as much as a lake if not more, as a global figure. a Forest will absorb and retain more water than a lake. 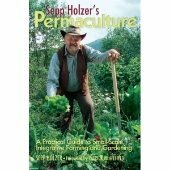 Sepp Holzer is a unique farmer, experimenter, man and maybe a permculturer. In refering to Sepp we have to start from a very clear point: his story is autonomous from that of the permaculture movement. As he says, once someone came to his farm in Austria and they told him he was doing permaculture, and he said: ok call it permaculture, there's no problem. For Sepp the important thing is you can label his work but don't try to tell him that something he does is not correct in a dogmatic permaculture view. I guess a good way to put it, is that Sepp is a wild selfseeded fruit tree that is growing close to a fruit tree cultivar put in position by design, Sepp Holzer is the selfseeded fruit tree that grows in a food forest because it found a niche and there it expresses its life cycle without having anyone brought it from the local nursery. One just looks at it and says wow! That’s Sepp and his work, you look at it and say wow! Sepp has published two books, Desert or Paradise is his second. The first being Permaculture. He has kept to his way of writing, and reporting his views, his achievements. When you read Sepp's books you don't take off the shelf the usual permaculture manual, but the field biography of a man that has passed his whole life with his feet walking on this planet, observing, and taking action. Reading his pages you look inside his field notebook, you take a glimpse inside his volcanic mind, the text is not thought of as a manual, it is direct, intense, and practical. Sepp in this book gives account of many of his works as a consultant, in Spain, Portugal, Turkey, Russia and Greece, following a theme that crosses all his work: restoring water management. If in the first book Sepp gave us an insight of his farm in Austria, the Krameterhof, to explain what he had done, in this second work he walks us through his work around the world demonstrating how there's only one solution to the problems of soil depletion, erosion, and pollution in all climates: tuning in with nature, not for us, not for here and now, but for the present and future together, starting from the observation of the past. Sepp explains that this is achievable through many different actions but of course the first more significant and stable is restoring water management, there's no life without water. 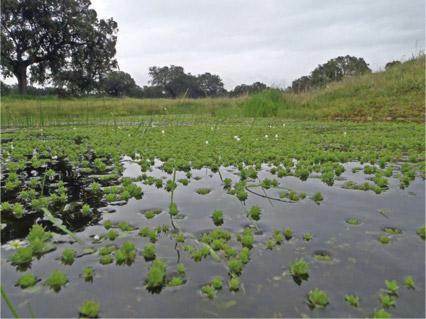 The construction of big lakes or small ponds, or even just planting trees, all of these actions focus only on one goal: restoring water retention in the soil. One thing that gives a new perspective is that Sepp describes some good idea's even for small properties, gardens, stepping into urban permaculture settings. Sepp is not only a large farm experimenter, he has come down to smallholdings, to urban gardens. Sepp gives the reader practical information, and even more than in the first book, the author has created some boxed info on specific subjects throughout the book, so to help the reader find quick reference. This book is a walkthrough of his achievements, not a book with the answers to every question, this book has to inspire the reader, as Sepp puts it in the preface, to think independently. Sepp hopes readers will learn to think differently about solutions, learning to see problems. One can't expect to find the solutions in the book but to get insight of how Sepp has observed a problem and found a solution. Of course Sepp's solutions are more than inspiring. I understand that he doesn't want to be seen as a leading man in the movement, he has always his humble way of being and explaining his work, but he has grown to be a leading figure. When you think of his work, when you read it, you see how it is magmatic, it moves onward, evolves, you read through the book passing from one page to another, from one subject to another all in one breath. 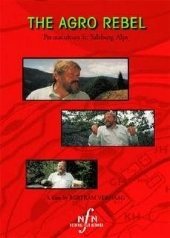 Sepp will never write a book starting from zones, or sectors of energy, in a way he has tried to fit his work into the permaculture standards but the outcome is not always perfect. You can’t embrace or give a fixed path to a mind, or work, like Sepp Holzer’s. You take Sepp for what he is, or you love him or you just get warm feelings for the way he is, because for sure he is not an easy person. 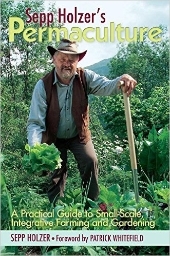 But in permaculture we don’t want easy, we want permanence, stability, and Sepp is a person that knows how to get there. 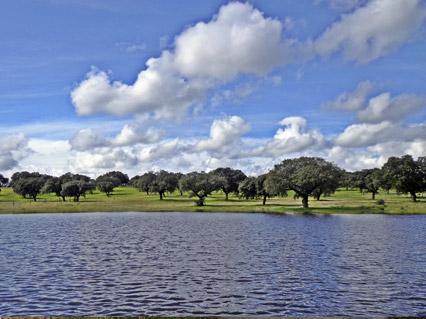 Sepp Holzer wrote: I could see straight away that southern Portugal's dryness is a result of human wrongdoing and is not its natural state. Decades, if not centuries, of intensive and incorrect cultivation methods have resulted in the drying out of the land. The annual rainfall is little less than that of Germany or Austria, the only difference being that almost all the rain falls in the winter. I give this book 10 out of 10 acorns! This is the first book by Sepp Holzer that I have read, and I really like his writing style and and the organization of the book. I appreciate the tenacity of Sepp Holzer's beliefs and the actions he has taken to do what he believes is right. I appreciate the examples of projects that Sepp Holzer has done in restoring degraded land that were provided in the book. Although there aren't many "recipes" (or "practical information") in the book, I do not mind this, because it speaks to what Sepp Holzer believes, "To be human is to think independently, and to be independent in our perceptions and thought processes. Making mistakes is part of life. One of the biggest mistakes of is the fear of making mistakes, because then we stop learning." Damn right! This was from the Preface of the book, and that sentiment carries through the rest of the book. Sepp encourages me to read nature and think independently by giving some guidelines and examples of how to read nature, sense nature, and tell where nature wants to do with the land. I feel I learned a lot by reading the book; it will take time to develop these skills, and that is on me to do on my own time. This book succeeds at what the author wanted to do with this book, and that is enough for me. It is an inspiring, optimistic, and thoughtful book that encourages further action and development on the part of the reader.